A dozen or so men quietly gather in the back of Hutchinson Commons in the Reynolds Club. This night, as well as the one before that, and the one before that, they sit long after dark and plot their next move. No, this isn’t a conspiracy. It’s just chess. 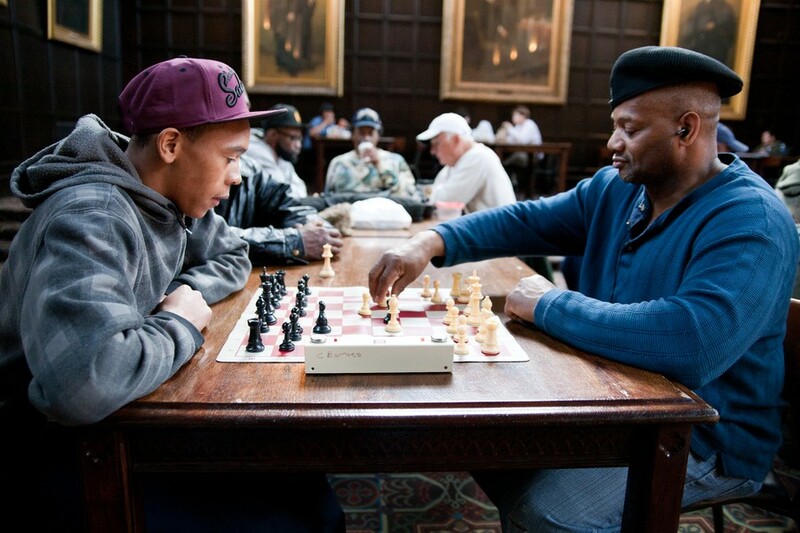 Speed-chess, to be exact, and the men who for years have been filing into the Reynolds Club carrying fold-up boards and game clocks come from all over the South Side. Their intentions vary, from pursuit of big-name grandeur to retirement-age recreation, but their competitive edge and love for the game keep them coming back night after night. One of them, Daunte Carter, has never given up his dream of going professional. A Springfield native who’s been castling rooks and promoting pawns for longer than most U of C students have been alive (30 years and counting), Carter used to take his game to restaurants but was frequently asked to leave. After the sole venue that would take him, a Burger King, closed down, Carter and his playing partner were out in the cold until last December. Then he heard about the Reynolds Club and ever since has been showing up to polish his game most days of the week. Carter is a C-ranked chess player in the United States Chess Federation’s rating system, which runs from A to J, putting him three levels shy of the official title of “Expert.” A regular competitor in Illinois tournaments, he’s in pursuit of becoming a Grandmaster. As of now, the largest tournament prize he has won is $15, but if he were to become a Grandmaster, he could make more than $250,000 in a national-level game. “I love chess because it’s easier to get your game published and gain fame,” he said. For players like Samuel Harvard, 67, whose interest in chess blossomed after he retired, the nightly routine is more about meeting people and keeping his mind sharp than climbing the long ladder to national stardom. Christopher Hood, another regular, can relate. With their unflagging, even ritual, adherence to the nightly game, players like Hood and Carter might seem like an exclusive club. But second-year Sid Patel, a member of the University of Chicago Chess Club, has gone head-to-head with several of the Hutch players himself. “I saw people playing chess in the Reynolds Club last year, and I asked if I could play, and they were happy to let me,” he said, adding that most of the students in the club have joined him.